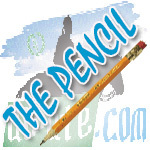 Home / Pencil / An Editorial That Raises One Question: Is Isaias Afwerki Sane? When Isaias Afwerki is finally removed from power, he will, like his sole friend Moammer Gaddaffi, have no friends to shed tears for him. 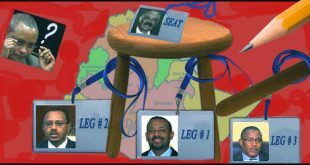 This is because Isaias Afwerki has, in 20 long years, exhausted the patience of the world with his embarrassing behaviour. 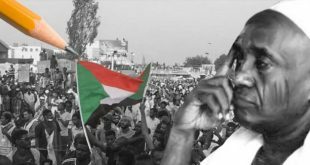 The recent undated press release which appeared on March 5th on the Eritrean regime’s website, shabait.com, is one more embarrassment. Entitled A Resolution That Raises Endless Questions, the press release takes its title almost literally and asks 83 questions as to why the Libyan dictator is facing UN sanctions. 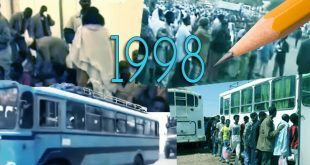 2000: Thirteen Eritrean scholars and professionals (G-13) wrote a letter to Isaias Afwerki demanding that he reform his regime. 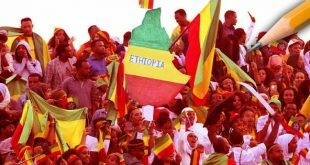 Given the public pressure he was facing at the time, he agreed to meet them in Asmara and he set the appointment for November 22, 2000. When they arrived, they were told he was unavailable so they spent two days in Asmara in meetings among themselves to decide on the questions they will ask him, who will do the asking, etc. When he finally saw them on November 25 at 2:00 pm at the Denden Club, and they read their letter to him, he “took a piece of paper out of his pocket that he said he had just typed it in his home computer” and read it to them. And now, for the mother of all comprehensive exams, Isaias’s long, rambling list of questions about why the UN is sanctioning Libya. The 1670 word press release contains 83 questions—92% of the statement is a list of questions. And they are not multiple choice questions either, probably because Isaias does not like to give his students—the world at large—choice. Another thing entirely missing from Isaias’s embarrassing questions is a sense of honor or shame. How can a person who is a criminal lecture others about law? How can a person who is not accountable to anyone demand accountability of others? How can a person who imprisons innocent youth, beats up the elderly, and makes national heroes disappear, and presides over a country without a constitution condemn others for violating rule of law? How can a person who doesn’t allow independent media in Eritrea condemn the independence of the world’s independent media? How can a person who has never been voted into office by the Eritrean people lecture others about the legitimacy of political power and elections. Well, we could go on. But we don’t want to give you our version of “endless questions.” Suffice it to say that Isaias Afwerki and his regime are delusional and when the wave comes after them, they will be exactly like the corroded regimes of Iraq, Egypt, Libya who maintained, until the last seconds of their existence, that they were invincible and laughed off all threats to their existence. And judging by the increasingly unhinged “press releases” they keep writing, there will not be one single country to stand up for them.